Churches can’t grow young unless they’re full of families who are growing with. The goal of the Fuller Youth Institute’s Growing Young Families Project was to build upon Growing Young findings by investigating how parents understand and describe their relationship with their children and the church as their teenagers and young adults grow in their faith and participate in churches. How do parents and churches jointly support young people’s faith journeys? We wrote Growing With because we wanted to help parents guess less and have better answers to their toughest questions. And to know that as their kids grow up, they don’t have to grow apart. As scholars, pastors, and parents of young people, we believe that today’s generation gap is often wider. This gap—as well as the innovative parenting bridges required to cross it—became apparent during our four years of Growing Young research, affirming that the role of ministry leaders who care about kids must also include the care, equipping, and formation of parents and families. Where did FYI get its research for Growing With? Good research reveals new findings and also raises new questions. To flesh out our understanding of Growing With parenting, upon completion of Growing Young we conducted interviews and focus groups with an additional 79 parents from across the United States. Nominated by church leaders, these parents, who help bring our Growing With parenting definition to life, stem from different geographical regions and denominations, diverse ages and ethnicities, and various marital situations. There are a lot of books for parents in bookstores already. What makes Growing With unique? It’s rooted in research and written by researchers who are parents of teenagers and young adults. You can trust this resource to have great information and empathetic authors who are parenting right alongside you. It speaks to young people’s three biggest quests, namely their relationship with their family, their faith, and their future. It demystifies the broad category of “young people” by offering three life-stages within the 13-29 year old age range to help parents know the changing roles they must play in their maturing kids’ lives. It inspires parents to remember that as their kids grow up, parents can, and must grow too. This is what we mean by Growing With. I’m a leader. Growing With is a book for parents. Why should I read it? If you’ve read Growing Young and you are attempting to implement the strategies from the book, you have likely recognized the need to better partner with parents. We wrote Growing With, with the leader in mind as we wanted to give you a reliable resource you can recommend and hand to the parents you lead and pastor. We know that people in your congregation trust your recommendations. We believe you can trust this reliable resource. We hope Growing With promotes more dialogue in churches. It is a resource that can frame relevant preaching topics. It can be a foundational guide for parenting small groups. It raises essential categories for any youth and young adult ministry and family ministry leader who believes that their ministry serves both young people and parents. Just because kids grow up doesn’t mean parents give up. Show them a new parenting posture that helps families grow together. 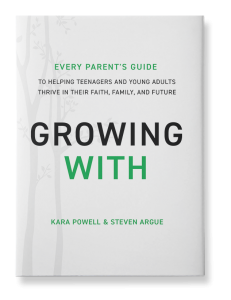 Filled with exciting new research and honest stories about the challenges and joys of parenting today’s teenagers and young adults, Growing With is a must-read for leaders nurturing families who long to grow together in faith. Bulk orders available through the Fuller Youth Institute bookstore.